It was a blustery commute from the Berkshires to Provincetown for a week on the Lower Cape. There was yet again April Fools weather with snow and sleet. Given the bad driving and delays we were just trying to find a place to have dinner before the final leg to our motel, Sandbars, in Truro on the beach. Being early or preseason most of the lobster traps were still closed. The selection of restaurants is somewhat limited. On a number of prior occasions we spotted the sign for Karoo Restaurant superimposed on a silhouette of Africa. Let’s face it, one heads to the Cape to feast on seafood. But on a downright miserable night, what the heck, we were game to try anything. In that spirit we were pleasantly surprised and this may indeed become a welcome destination for further commutes to Provincetown. Eastham is a hop skip and a jump from Wellfleet which has a bunch of popular seasonal restaurants. All of which on this miserable night were still in hibernation mode. It was a Friday night and the place was packed with what appeared to be locals. Most tourists have the common sense not to be out and about. The décor was brightly colored with an African motif. Having visited Senegal we welcomed the ambiance. But you will find the cuisine of Chef Sanette Groenwald, of Afrikaner Dutch heritage, to be no mirage. The food draws on Dutch, African, Malaysian, Portuguese and Indian flavors and traditions. The most difficult challenge was choosing from the enticing and exotic menu. The waitperson was most helpful in discussing her favorites as well as the most popular dishes. The top selling entrée proved to be Cape Malay Stew served over tumeric rice with a side of chutney. ($17.50). It is a blend of curry, coconut milk and vegetables. There is a choice of protein: Chicken, tofu, shrimp or mussels. Astrid opted for mussels. They came with that mildly spicy and delicious sauce. The one I sampled was scrumptious. I went for the spicier Curried Lamb Stew over tumeric rice, ($18.50). It was awesome with the only complaint that it seemed to disappear too quickly. After a long day on the road it was not quite enough food. Perhaps we should have sampled the appetizers, sides and salads. For beverage I had a strong ale on tap ($5.50). Looking at other tables there appeared to be a generous pour of wines by the glass. Some people appeared to only have drinks and appetizers. 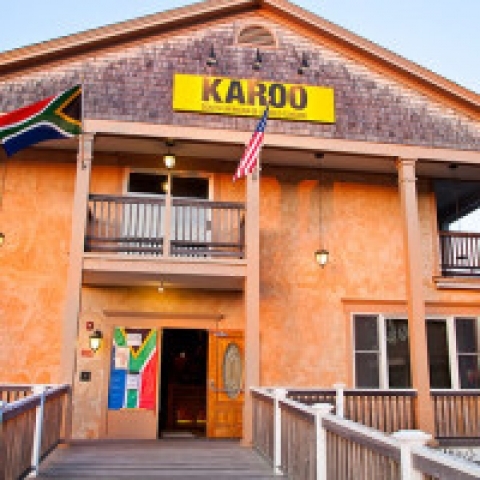 One sensed that Karoo is a popular after work bar and hangout. While just passing through we will be sure to return.